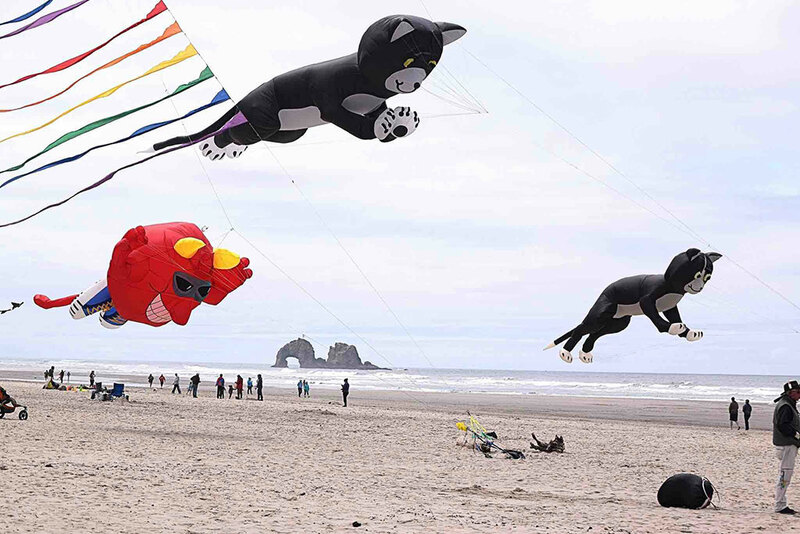 Every August, the American Kitefliers Association, the largest kiting organization in the world, sponsors the Rockaway Beach Kite Festival. The event, which is based at the Rockaway Beach Wayside, a large parking area in the center of town, affords the public an opportunity to watch professional and amateur kiters manipulate kites of all shapes, colors and sizes with the beach and Pacific Ocean as a backdrop. Festival organizers encourage anyone who wishes to bring his or her own kite and participate in contests. Kids are welcome to take free classes in building and flying kites. Many people who attend the festival simply stake out a spot on the beach and enjoy the show. The festival also features kite exhibitions, live music, vendors and food throughout the weekend. The community is known for its 7 miles of flat, sandy beach, traditional beach town shopping and food options – ice cream, saltwater taffy and clam chowder, for example – and general relaxed atmosphere. The Oregon Coast Scenic Railroad locomotive adds to the resort town ambience announcing its frequent arrivals at the Rockaway Beach train station with a telltale whistle and plume of steam. Book one of more than 100 vacation rentals or more than 200 hotel rooms in Rockaway Beach and stay for the whole weekend. Watch this video, by Cody Cha, for a close look at the Rockaway Beach Kite Festival.